The Oxford English Dictionary added over 1,100 new entries in its January 2018 update. Wordsmiths the world over now have the official go-ahead to use ransomware, EULA, and mansplain, which should make life easier for misogynistic IT security experts. Tech terms like e-address (who says that?) and esc (not to be confused with ESC, even though they’re the same thing) made the list, but for once it wasn’t all about OMGs and LOLs. The clear star of the January update is the word “ransomware,” which after being on a lot of computers in 2017 deserves a spot in the “definitive record of the English language.” As Naked Security writer Paul Ducklin pointed out, however, OED’s sister publications already had ransomware – now even stodgy people who only speak the Queen’s English do too. dickish – Hopefully not a new TV show on ABC. Aunt Flo — No relation. hangry – What you become when your autonomous pizza delivery vehicle gets lost. And 96 words beginning with “self” such as self-obsession and self-exciting. Also making the list this year is the much anticipated crowning gem of English langauge: mansplain. 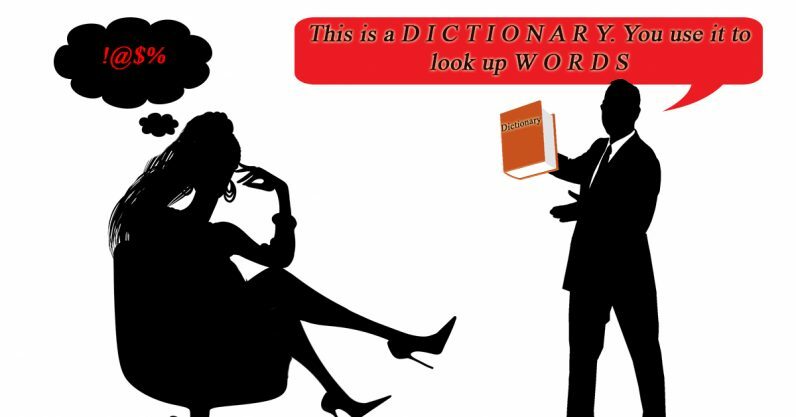 Rather than give you the OED definition (like a nerd) we’ll take our time and explain it to you. Big words can be tricky. Mansplaining is when a man explains something obvious, usually to a woman, in order to show the world he isn’t afraid of looking like a jackass. Pay attention: it’s a combination of “man” (which is another way of saying a male human) and explaining (which is when you describe something to someone who isn’t as smart as you) and when you put them together you get “mansplaining” (which is a word that was recently added to the Oxford English Dictionary).